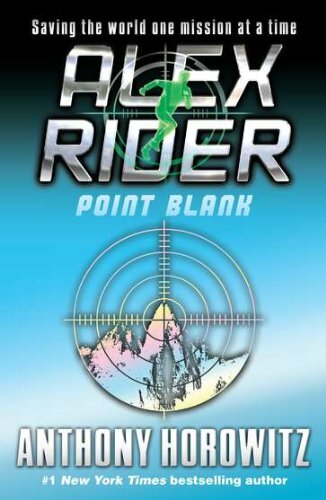 Alex Rider is coerced, once again, by MI6 into completely an undercover mission. This time a crazy scientist named Dr. Hugo Grief tries to take over the world by replicating clones of the world’s wealthiest and most powerful men’s sons. He wants to create a worldwide apartheid. Alex goes undercover at the school to get more information. He is captured but escapes, getting severely wounded in the process. He goes back – however – with his old SAS team to save prisoners. Wolf is killed in the rescue mission, but so are both the villains. Later Alex is attacked by a clone of him. One of falls off a roof into an fire – it isn’t revealed which one. Major cliff-hanger! American billionaire Michael J. Roscoe is killer in New York by a contract killer known as The Gentleman. He tricks Roscoe into falling down an elevator shaft, making the death look accidental. Back in London, Alex Rider gets into trouble with the police by exposing a drug dealer. He breaks into a crane and, using the crane’s hook, lifts the drug dealer’s house boat – which they are using as a meth lab – and attempts to drop it in front of the police station. Instead he crashes the boat into the building. MI6 manage to wangle their way out of the charges against Alex and coerce him into going undercover – on a mission – for them in return. Turns out that MI6 are suspicious about Roscoe’s death, and the death of another billionaire named General Viktor Ivanoc. The deaths are only linked by the fact that both men’s sons attend Point Blanc – a mysterious reform school in the French Alps, run by a South African scientist named Hugo Grief. Roscoe reached out to Alan Blunt – head of MI6 and Alex’s boss, kind of – before his death, but died before he could tell Blunt anything. This is what is spurring the interest in these deaths. Blunt sends Alex to Sir David Friend – a supermarket king, and billionaire – to spend a week with him and his family to learn everything he can about them. Blunt wants Alex to pretend to be Friend’s troublesome son, so he can be sent to Point Blanc as a student and see what was making Roscoe suspicious about the place before his death. Alex’s stay is made hard by Friend’s daughter, Fiona. Her friend’s shoot at Alex when they go out on a hunting trip. Later, Fiona and Alex go out horse riding. Fiona falls off her horse in the middle of a railway tunnel. Alex manages to ride back, grab Fiona and jump off the bridge into the river with her before getting run over by a train. Fiona apologises to Alex and tries to kiss Alex. He rejects her. Mrs. Stellenbosch – Hugo Grief’s assistant – arrives at Friend’s house by helicopter to pick up Alex. Smithers – the MI6 gadgets man – meets Alex undercover as a farmer. He gives Alex some gadgets to help him during the mission – a small hand grenade disguised as an earring, an electric saw disguised as a Sony Discman, a bulletproof ski suit, night-vision ski googles, and a single-shot tranq. Gun disguised as a HP book. Alex is flown to Paris by Mrs. Stellenbosch. His dinner is drugged and when he staggers up to his room and collapses into bed, his room is transported into a lab. Here Mrs. Stellenbosch and a team of scientists strip Alex, and proceed to photograph, examine and measure him. His clothes are put back on, and he is return to his hotel room. When Alex wakes he realised he had been drugged but doesn’t know why. At Point Blanc, Alex meets Dr. Grief and the small group of students that go to the school: Hugo Vries, Tom McMorin, Joe Canterbury, and James Sprintz. He befriends Sprintz who admits to Alex that the school is ‘weird’: the boys come into the school rebellious and troubled kids but become strangely complacent. Sprintz gives Alex a tour of the school and reveals to him that he has a plan to escape the school. Later, Alex sneaks out of his dorm room using the Discman and sees a boy being forcibly dragged downstairs. He thinks its Sprintz. Later again, however, he seems Sprintz – relatively unharmed – in his bedroom. At breakfast the next day, James has changed his mind about the escape plan and Alex realises that he’s become as strange as the other students. Alex climbs a chimney up to the forbidden third and fourth floors, to see what’s up there. He discover that the floors are exact replicas of the first and second floors. Each student’s bedroom has a replica and there is constant video surveillance of the downstairs rooms. Alex signals MI6 – using the CD gadget. The signal is received but Mrs Jones and Blunt debate whether they should make a move on the academy or not. Blunt decides not to act immediately but prepares a standby team. Alex keeps investigating and finds a jail where Sprintz and Paul – the son of Roscoe – are being held. Sprintz tells Alex that it was him being dragged downstairs the night before and that a replica took his place. Alex reveals his true identity to the boys and his real reason for being at Point Blanc. Mrs. Stellenbosch is alerted to this, after Alex was overheard on a bug planted in the cell. A guard knocks Alex unconscious and handcuffs him to a chair. Dr. Grief comes in and does the who “evil guy explains why he is evil and what his big evil plan is” speech. Grief imprisons Alex. He plans to dissect Alex – while alive – as the next day’s biology class. Alex uses his ear-stud grenade to escape. He improvises a snowboard (with an ironing board) and tries to escape down the Alps that way. Grief sends guards on snowmobiles, with machine guns, to hunt Alex. Alex tricks the guards – as always. One crashes into a tree, and another is hit on the head by Alex’s snowboard. Alex makes it to the bottom of the slope but a machine-gunner is waiting at the bottom too. He tries to jump onto a passing train, but is hit, loses his balance, falls and passes out. At the hospital in Grenoble Alex was taken to, the nurse informs Mrs. Stellenbosch – posing as a concerned schoolteacher – that Alex has died. He isn’t dead really though. Alex and his old SAS team – including Wolf, the guy he trained with – help to break back into the school. Half the team go to save the imprisoned students but a massive fire-fight breaks out. Wolf demands that Alex stays back. Alex goes into the dining room where Grief is escaping via helicopter. Mrs. Stellenbosch appears and attacks Alex, she pins him against a wall and grabs her gun out. Wolf appears and tries to save Alex, getting shot three times in the process. Wolf manages to shoot back, however, and knocks Mrs. Stellenbosch out a window. Alex drives a snowmobile up a ramp and crashes it into Grief’s helicopter, jumping off it at the lasts second. Alex is debriefed by Mrs Jones who tells him that all of the fifteen clones have been arrested. Alex goes home, where his guardian Jack tells him the school’s headteacher (“principal” in Australian) wants to see Alex. He goes to his school and is startled to find the sixteenth Grief clone – surgically altered to look like Alex – there. He remembers what Mrs Jones said about “all FIFTEEN clones being arrested”. The clone tries shoot Alex but causes a fire to start in the science laboratory instead. Alex tries to escape onto the roof. The two fight and one of them falls into a hole on the roof, followed by an explosion.